What is the importance of being able to place a name upon the things we create? Perhaps it gives one the ability to become more than just a faceless member of a crowd, to leave behind a mark of what they have made. Historically, women have often remained nameless with the things they create. This is one reason designer Anne Allen (English 1749/50 – 1808) is so special; in a time when female artists were not often recognized, Anne Allen emblazoned her name upon her finely crafted work. 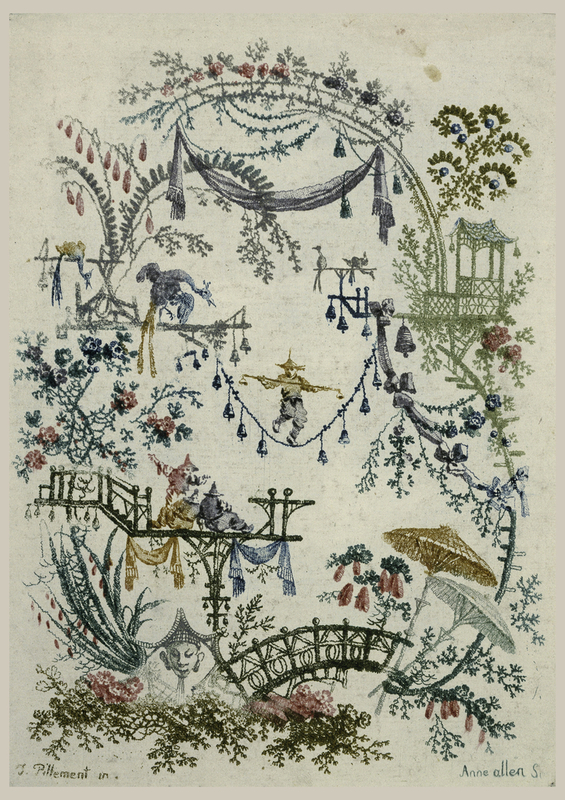 This plate is one in a series of chinoiserie prints from the Nouvelle Suite De Cahiers Chinois a L’Usage des Dessinateurs et des Peintres based on the paintings and designs of Anne Allen’s husband, Jean Pillement (French 1728-1808). Pillement was an infulential designer and painter whose creations inspired eighteenth-century French taste in home décor, from wall paneling, to upholsteries and textiles, many of which are still used today. This particular collection of prints was meant to serve as inspiration for other designers. International trade between Europe—specifically England and France—and China increased in the mid-18th century, and Chinese goods became all the rage in France. Broadly defined “Chinoiserie” and related exoticism were highly sought after for decorative furnishings and are often referred to as ‘chinoiserie’. This cultural appropriation and reimagination of style inspired artists like Jean Pillement and Anne Allen. Allen in turn used her husband’s designs to create etchings, gathering them into nine suites of chinoiserie and floral prints. Allen uses a printing technique called “à la poupée” to achieve the multicolored effect. À la poupée literally translates to “with the doll” and refers to the technique in which different colored inks are applied to the same copperplate. The doll is a wadded ball of felt or fabric that wipes the colored ink onto the plate. Most interestingly, Allen used two copperplates to layer the colors and produce an even more vibrant effect. Instead of showing the various chinoiserie elements individually, she layers them in a playful and imaginative manner, making the image enjoyable. The designs seem to float in space resulting in a dreamy and fantastical print that furthers the perception of the far east as a mystical exotic place. A disconnected cartouche forms around the floating images of birds, bridges, masks, parasols and gazebos. Three figures cluster together to watch a figure balancing on a rope with dangling bells. Vegetal swags, roses and bushes seem to grow from every corner of the print. Allen taps into the playfulness of the French style in this visual suite of fantasy. The presence of Allen’s name on each piece, alongside Pillement’s, suggests a balance and equality not experienced by many female artists of the time. Anne Allen stands out as someone unafraid to place her name upon the work that she made. Indeed her name is even found on the frontispiece to this collection of prints. Delicacies. Edited by Amy N. Worthon. Des Moines Art Center, 2012. Published in conjunction with the exhibition “Delicacies” shown at the Des Moines Art Center.